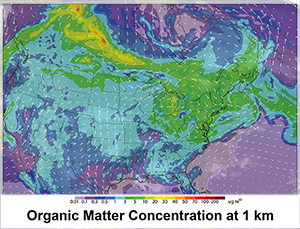 A new modeling approach from PNNL and NASA more accurately depicts how black carbon and sulfates interact with clouds, helping to answer the long-standing question of how these pollutants affect climate around the world. Shown is the mass loading of organic aerosols at 1 km above the surface (colors) and wind vector (arrows) valid at 21 UTC on 16 July 2012 during the ARM Climate Research Facility's Two-Column Aerosol Project (TCAP). Results: It's a double dose of climate disturbance. Tiny particles of pollution—also known as aerosols—both cool and warm the planet. Now, a team of scientists from Pacific Northwest National Laboratory and NASA identified how current climate models may be far off in estimating the actual amounts of these particles and their total impact on the atmosphere. As reported in Geoscientific Model Development, the scientists developed a new modeling technique that revealed the dramatic effect cumulus clouds can have on these tiny pollutants and vice versa. Based on these results, current climate models may overestimate the amount of climate-warming black carbon particles by as much as 50% and underestimate climate-cooling sulfate particles by as much as 40%. Why It Matters: Scientists have worked for years to understand the climate effects of tiny pollution particles like black carbon (a.k.a. soot) and sulfate, released through burning fossil fuels and biomass. Black carbon absorbs sunlight, creating a warming effect. Sulfate reflects light away from the surface, leading to cooling. These particles can serve as cloud droplet seeds, increasing the number of drops that make up the clouds. On the other hand, cumulus clouds may play a large role in removing those same particles from the air—simply by raining. But by how much? "This approach of more accurately modeling cloud processes can be applied to better our understanding of the aerosol lifecycle on regional and global scales," said Dr. Larry Berg, atmospheric scientist at PNNL, who led the study. Methods: Scientists developed an enhanced modeling technique to account for the portion of an area covered by clouds, the way aerosols become entrained in clouds, and what happens to them within clouds. The research team added information on key processes such as the development of cloud drops, changes in liquid chemistry, and removal of the aerosols by rain. To test their approach, they applied this new technique using the Weather Research and Forecasting Model coupled with chemistry (WRF-Chem). They then compared results from the modified model with real-world data collected from aircraft during the U.S. Department of Energy's Cumulus Humilis Aerosol Processing Study (CHAPS). CHAPS was conducted in June 2007 over Oklahoma City to characterize and contrast freshly emitted aerosols above, within, and below fair-weather cumulus clouds. In all cases, the new approach yielded results that matched CHAPS data. What's Next? Scientists are permanently adding the new technique to the next version of WRF-Chem. They also plan to develop enhanced formulas for other processes, including those that account for changes in the amount of sunlight reflected by clouds. Their work will help develop more accurate models that may finally determine the true face of black carbon and sulfate and how they are affecting the world's climate. Sponsors: U.S. Department of Energy's (DOE's) Office of Science Office of Biological and Environmental Research sponsored this work as part of the Atmospheric System Research Program. The NASA Science Mission Directorate and the NASA CALIPSO project provided additional support. Research Team: Larry Berg, ManishKumar Shrivastava, Richard Easter, Jerome Fast, Elaine Chapman, and Ying Liu, PNNL; and R Ferrare, NASA Langley Research Center.